What Is a Glueless Lace Front Wig? "What is a glueless lace front wig?" The worlds of lace is an evolving one and the glueless lace front wig and glueless full lace cap wigs are part of that evolution. Gone are the (so-called) shackles of lace wig glue (adhesives) and lace wig glue removers, you are now free to wear a lace cap wig in the same way as any standard monofilament wig - hooray! If you’re new to the world of lace cap wigs, here is where we’ll explain it all and start with the basics and break up the term. Glueless (not a real word we know, but is known and understood in the wig industry so we’ll use it here) tells us that unlike traditional lace cap wigs that require lace (front) wig glue, the construction of the cap of this wig does not require the use of lace wig glue in order to be worn. The "lace cap" part means that the hair is still hand tied or ventilated in the traditional way onto a primary lace base. The lace will still require cutting back close to the wig’s hairline. What’s great about these lace cap wigs is that there really is a complete choice – you can have all the benefits of a lace cap wig without having to use adhesive. You can opt for "glueless" lace front wigs or if you prefer you can choose "glueless" full lace wigs. "How Does A Glueless Lace Front Wig Work?" The glueless lace cap wigs work by the use of reinforced lace around the perimeter, adjustable straps at the back and clips, or wig combs that are attached to the, top, sides and back of the lace cap wig. 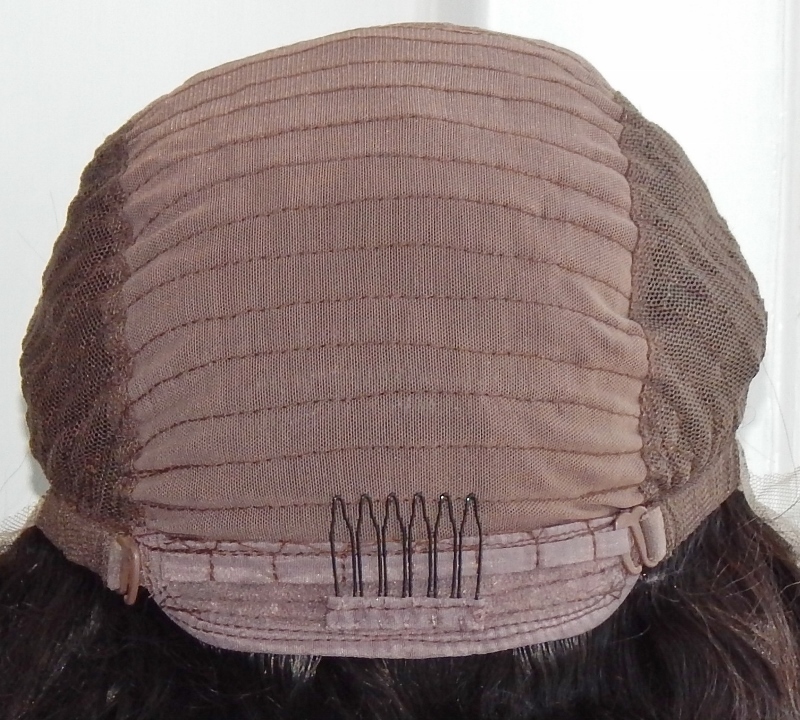 The cap is constructed to “cling” to the head, ensuring the lace hairline lies against the head as they usually come with stretch panels and if they don't then they'll be kitted out with adjustable straps, clips or combs. "How Much Does a Glueless Lace Front Wig Cost?" If it's a human hair wig it will cost the same as a comparable lace front wig or full lace wig (the addition of straps, clips and combs doesn't make the wig more or less expensive). All the elements of a lace cap wig are still present in a glueless lace wig - the hair is still hand tied, knots may be bleached depending on the hair colour, the wigs still have lace whether Swiss or French; your savings will come from not needing to purchase adhesive or adhesive removers...ta dah! Why not check out our glueless lace front wigs. "Are there Disadvantages to Glueless Lace Front Wigs?" The main disadvantages come from wearing a glueless lace wig overnight as in sleeping, (not partying!) or wearing a glueless lace wig in water. If you choose to swim, the weight of wet hair may cause the wig to move or slip - bobby pins may help prevent movement. If you tend to move a lot when you sleep, there is also the possibility that the wig may move - if you're able to, take the lace wig off at night, if you're unable to, then a neat ponytail or scarf will help. "What are the Benefits of a Glueless Lace Front Wig?" The main benefits are that you don’t need to buy a lace front wig glue (adhesive) or any of the lace wig glue (adhesive) removers -once you buy your glueless lace cap wig, you're good to go! If you ordinarily wear wigs that do not use adhesives and would like to try lace wigs, then a glueless lace cap version may be the best place to start. Righto, that's the caper through glueless lace cap wigs but you can find out about the different cap constructions and how to care for glueless lace wigs in the glueless cap construction and care guide. There are all sorts of questions in the Lace (front and full and traditional) Wig Q&A section or if you'd like to keep up to date with the next guide about hair weave, hair extensions, wigs and hairpieces then, join our blog.